Besides opening its doors to the community during Art Basel with such international draws as Ai Weiwei’s exhibition and the museum’s initial special project commissions, PAMM also took its first steps in showcasing selections from its permanent collection. These are presented in six “overview galleries” through a series of thematically linked exhibitions called AMERICANA, composed of art produced in South America, North America and the Caribbean since the 1930s. The organizing principle of AMERICANA’s Progressive Forms section is the legacy of Constructivism, whose European origins in the early 20th century commingled with industrialization, social progressivism, daring new architecture and rationality. With that came an affection for the purity of abstract form, “liberated” from representation. Tobias Ostrander, PAMM’s chief curator, explained the connection between “construction” and Constructivism. “Construction was put in contrast to the idea of creation,” he said. Creation implied more subjectivity, while Constructivism leaned away from emotion and embraced objectivity. The work of such European Constructivists as painters Piet Mondrian and Theo van Doesburg — known for geometric grids imbued with color blocks — and sculptor Antoine Pevsner influenced the works on view both at PAMM and ArtSpace. Constructivism’s advocates considered abstract design better suited to a forward-looking society, and their work influenced subsequent movements such as pop and op art, kineticism, abstract expressionism and minimalism. Constructivist aesthetics and social ideas were carried across the Atlantic by artists including Romanian-born Cuban émigré Sandú Darié and the peripatetic Uruguayan-born Joaquín Torres-García, who was responsible for extensive and passionate “evangelizing” in Latin America. Exhibitions and publications in Europe and the Americas helped both disseminate and diversify Constructivist images and ideas. PAMM’s Torres-García Construction with Two Masks incorporates pre-Columbian pictograms, as well as informal modern texts and symbols within box-like compositions. But it is Darié’s work that bridges the PAMM and ArtSpace exhibitions. He is represented at PAMM by his Transformable Structure. A Mondrian-like geometric composition of black, white, red and yellow, it is both painting and sculpture and can be displayed in various configurations. Darié’s interest in dynamic geometry carries to his Untitled 1950s painting at Virginia Miller, where an even more exuberant palette of Mondrian colors, lines and color blocks plays against concentric rotational rings. 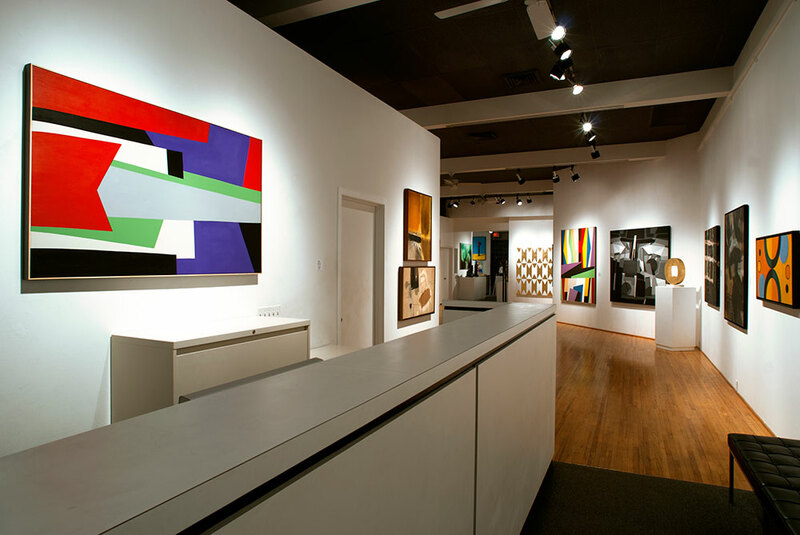 The ArtSpace exhibition, The Silent Shout: Voices in Cuban Abstraction 1950-2013, is notable for several reasons. The works were selected by a trio of curators: José Angel Vincench (one of the exhibiting artists), Miami-based Janet Batet and New York-based Rafael DiazCasas. It includes Cuban artists’ works created in a diversity of abstract styles since the 1950s. And though it is shown in a commercial gallery, it includes works loaned by collectors and not for sale. This unusual arrangement was apparently necessary to realize the multigenerational curatorial vision Miller was keen to assemble. “I’m very happy to have presented this show, so that others may marvel, as I have over the years, at how one island in the Caribbean has so enriched the world,” she wrote in an email. 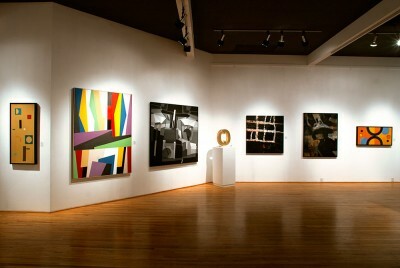 ArtSpace has exhibited Latin American art, including from Cuba, since the mid-1970s, but it was Vincench who interested Miller in presenting works by members of Cuba’s most renowned associations of artists working in the abstract idiom, Los Once (The Eleven) and Diez Pinturas Concretos (Ten Concrete Painters). In Cuba, following the Castro revolution, abstract art was discouraged — despite its original connection to the Russian Communist revolution. It was characterized as bourgeois, and its practitioners were stifled, with minimal exhibition opportunities. In 1997, Vincench co-curated a breakthrough show in Havana called Pinturas del Silencio (Painters of Silence). Batet, who wrote the Pinturas catalog essay, explained to Miller that the mid-century Cuban abstract painters, influenced by European Constructivism and the Bauhaus, were working alongside a vanguard of new architects, creating a modern city within colonial Havana. “Abstraction in Cuba was reflecting our new identity as one of the most modern cities of the Western hemisphere at that time,” Batet said during a 2013 seminar in Miami and printed in the show’s notes. With a little study, the “hidden messages” can be picked out, and he uses gold leaf on both his sculptures and paintings to underscore art’s often-conflicted relationship to commerce — especially in a Cuban context. Whereas variations of rectilinear scaffolding underpin many of the selections in PAMM’s Progressive Forms, fewer of those in Silent Shout are geometrically conceived. Despite the five decades that separate them, paintings by Carlos García and Raul Martinez suggest a distillation of natural forces and forms. Nuanced overlays of thick and thin paint create scumbled surfaces that glow darkly, evocative of both man-made and earthly objects. They provide the bass notes in a presentation that also contains clarion calls of hard-edged, brilliantly colored zigzag compositions by José Rosabal. These somehow balance the quieter arcs and angles of the Vincench Exile series and the circle motifs shared by the 1956 Soldevilla and 2013 Luis Enriquez López. An especially painterly work, Four Trees of Fire (2013) by García, contains both text and representational reference. Four artists’ names are painted with varying degrees of tone and texture against a bright orange-tinged yellow background. “When we asked him why, he explained that as he painted this canvas, he was thinking of the extraordinary way J. M. W. Turner brought out the light in his paintings,” Miller said. He also was inspired by Impressionist Claude Monet’s sense of color and light, and the dramatic use of shadows in the work of American realist Edward Hopper. American Cy Twombly, known for his “scribbles,” also influenced the work, he told Miller. On another level of reading, the figure “4” is formed by horizontal shadows crossing and connecting the vertical trunks. The Silent Shout’s display gives each painting just enough room to sing its distinctive song, but judicious orchestration of colors and contrasts lends an overall harmony to these quite disparate works. “Because the older work is so different and darker than the later work, we tended to hang that in one area,” Miller said. At PAMM’s Progessive Forms, geography ranges across the region in works by Hélio Oiticica and Lygia Clark from Brazil, Mexican sculptor Damián Ortega and Venezuelan photographer Alexander Apostól — among others. But it also extends to New York Minimalists and Canadian-born Julia Dault. The extensive wall texts provide valuable context. In Latin America during the post-World War II economic boom, the use of geometric forms was closely associated with economic prosperity and the planning of ideal cities. However, some members of later generations of artists eroded, fragmented and destabilized these forms to critique the many unrealized dreams. Ortega is moved by Mexico City’s juxtaposition of extreme poverty and wealth. He uses the cement of ubiquitous construction sites to model the ideal form of a cube, but he does so in Ioni with “soft,” irregular segments that undermine that pristine notion. Apostól’s photos bleakly present abandoned high-rises on the Venezuelan resort island of Margarita, revealing their grid-like structures as skeletons. Leonardo Drew’s arresting wall relief assembly of burnt and stained wood fragments reveals a dystopic vision within the United States, Ostrander says. The gallery provides excellent opportunities for visual juxtapositions among the freestanding sculptures and wall-mounted works. 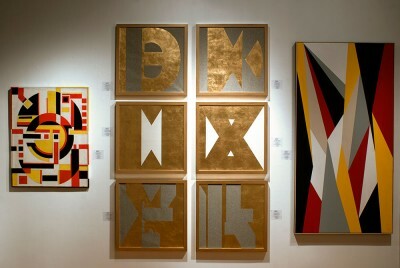 For example, while standing in the Progressive Forms show, one can look into the Sackner Collection of Concrete and Visual Poetry, where many examples of text and graphic arts also show the Russian Constructivist legacy. “We’re very specifically trying to make those conversations and juxtapositions,” Ostrander said. Not all the exhibited works are historical — one sculpture was actually created within the gallery by Dault. “She’s an artist whose very much thinking about the legacies of minimalism and, particularly, the use in minimalism of industrial materials,” Ostrander explained. Dault takes large sheets of mirrored acrylic plastic and uses them in a kind of performance. “She ties and pushes and curves these Formica pieces … and then she ties them and attaches them to the wall, creating these very dynamic kinds of mirrored curving structures that feel like they could burst,” Ostrander said. Stylistic contrasts abound, but many affinities of structure and intention cross the generations in these ambitious exhibitions. Encompassing broad geographic and historical examples, both shows demonstrate that abstraction remains an intellectually challenging and sensually appealing vein of work with unbounded potential. Go to here to hear Virginia Miller describe her installation process. Go to here to hear Tobias Ostrander’s comments about Constructivism and the grid motif.